Calmer waters can be found along the eastern part of the island: Miami Beach, Accra, Sandy Beach and Dover Beach. 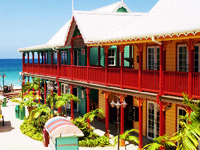 Christ Church's main town is Oistins, which is Barbados' major fishing port. Every day, the fishermen's catch is sold at the waterfront market. And, every Friday, the town has a special event it calls the "Fish Fry", where locals and tourist enjoy the seafood delicacies and dance to lively Bajan music. Local crafts are also sold in booths along the town's main streets. St. Lawrence Gap, often called The Gap, is Christ Church's most popular road. It is lively during the day, but a whole new meaning of vibrancy and animation is embraced along its mile-long strip at night. It has many bars and clubs where the best DJs and bands, both local and foreign, play music until the wee hours of the morning. There are two good golf courses in Christ Church: the Rockley Golf and Country Club and the Barbados Golf Club. The Anglican churches in this parish are known for their old English architectural styles, but the Christ Church Parish Church is famous for another reason: the legendary coffins in the Chase family vault. According to the story, five family members died within the same decade. The first coffin was laid inside the vault and then sealed. Two years later, another member died and when they opened the vault, the first coffin had moved. After a few years, another family member died and when the vault was opened again, they discovered that two coffins have also moved. When the coffins moved again for the fourth time, they were then relocated.